Provide tools that could transform disparate data sets into fabric-ready data that could be loaded into Esri’s Canadian Parcel Data Model (CPDM). Provide stability, reliability and flexibility to perform complex quality-assurance checks on a parcel fabric of over 2 Million parcels in different testing environments. 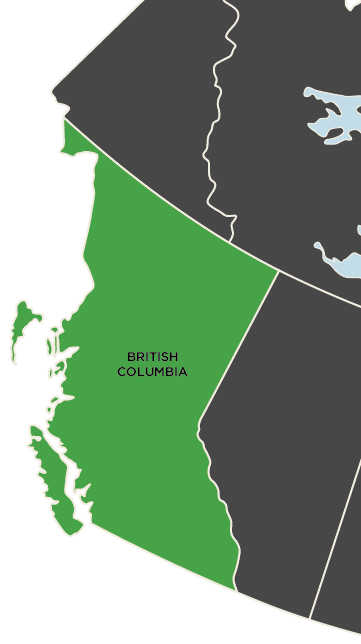 The ParcelMap BC (PMBC) project required using data from a variety of disparate datasets to create a single, complete, trusted and sustainable parcel fabric of all active titled parcels and surveyed provincial Crown land parcels within the province of British Columbia. Once the parcel fabric was created, it required thorough checks for completeness and correctness. Safe Software’s FME® was integrated into the solution to perform the many tasks of loading, transforming, extracting, and checking that were required for the project. Parcel data was first loaded and modified into staging feature classes, which were then cleaned up and prepped for transformation into Esri’s CPDM. The newly-created parcel fabric was then rigourously checked with a variety of quality-assurance tests. Generate staging polygons and staging lines to be used in the parcel fabric creation process. Replace stroked curves in polygons with true curves. Calculate the Combined Scale Factor (CSF) for each staging line using a Digital Elevation Model (DEM). Assign attributes to polygons and lines. Generate parcel fabric connection lines to support Least Squares Adjustment (LSA) functionality. Guarantee accuracy through data load and transformation. FME® is stable and reliable for handling very large datasets. Scripts are easy to re-configure leading to faster update cycles. In this multi-year project, data needed to be continually enhanced to keep up with current technology (i.e. data model updates). Ability to set up complicated data joins on multiple fields. Assigning attributes in FME® is much more time efficient than performing individual field calculations. 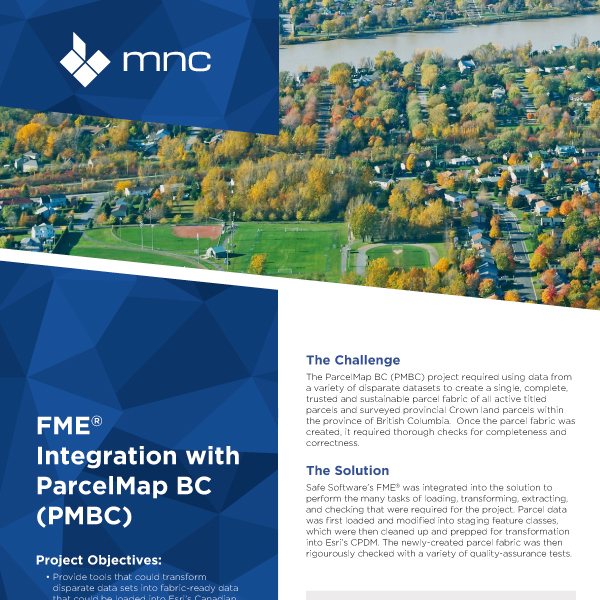 FME® has specific transformations for issues encountered in PMBC. Checking for spikes, gaps, and overlaps in the parcel fabric is easier in FME®. Log files are produced each time a script is run, and are easy to investigate. Outputs from each transformation can be analyzed directly within the FME® script canvas. The Inspector Transformer allows users to easily locate and de-bug issues; saving time and money. Testing is straight-forward and repeatable, and it is easy to prompt and run scripts. Data discrepancy outputs from tests can be formatted to simplify analysis. Scripts are scalable and can be run in multiple different environments. Users in different locations can run scripts on different systems (postgres or file geodatabase).